Kids often say things that tickle our funny bone. Some kids never outgrow it. Never one to "count" or use a timeout to avoid more effective corrective action when my children were little, I decided one day to give Joy a warning by counting to three. She totally disarmed my effort to be a stern parent. I counted "one....". With a gleam of mischief in her eye, she immediately said "two." Barely two years old, I didn't even know she could count! Completely surprised, I couldn't help but laugh at her. Joy-1, Mom-0. Today at nearly fourteen she still says the darnedest things. "Mom, your ears are so big! Did stress do that to you?" If stress makes one's ears grow large, then like Dumbo I could probably flap mine and fly right out of here. God bless her! She made me smile again and reminded me that God gave me kids for a reason: to help me lighten up on occasion when the stress of parenting makes me want to join the circus. Guess I'll just save the gas and stay home. My life is a circus! Have you ever had a moment when you regretted caring about someone? A moment when all the effort you poured into helping them backfired in an avalanche of criticism and hurt? A moment when you thought to yourself, "Why bother? This isn't accomplishing anything but frustration for both of us." We all have moments like these and wish we could simply not care about the difficult people God brings across our paths, particularly when our caring seems unappreciated and ineffective. Yet God has wired us to care for those we love; in fact, it's darn near impossible not to care. Why do we care anyway? What motivates us to care for someone who refuses to heed advice when we have already tested the waters, been burned, and discovered that there is a better way of living? Is it that we don't want them to make the same mistakes we did or suffer the consequences of their choices? Or is it that we are so consumed by our controlling nature that we refuse to relinquish control to a sovereign God who is far more capable of making things right with that individual than we ever could? Bottom line: Do we trust God? Sometimes I wish I didn't care. Some days I just want a day without caring. What if God felt that way about us? Where would any of us be if He ceased to care? What if we could learn to care without controlling, pray without interfering, and to trust that God is in control instead of worrying about what we cannot control? That's easier said than done. It may be impossible to live a day without caring for those we love but that doesn't mean that caring has to drag us down. We may simply need to spend a little more time caring for ourselves and those who truly appreciate us. As we learn to rejoice always, pray without ceasing, and give God thanks in all things, we will find peace and walk in the joy of our relationship with Him. Like so many around the world I was intrigued by famed aerialist, Nik Wallenda's, recent attempt to walk a tightrope across a portion of the Grand Canyon. Having witnessed his previous sky walk over Niagara Falls, I was eager to see if he would succeed in his venture to surpass that crossing. Although I missed the live telecast of his canyon crossing, I made sure to tune into the replay a few hours later. Knowing that he must surely have made it across or the replay would have been canceled, I settled into a chair to catch the pre-event commentary and interviews and Joel Osteen's prayer just before Nik Wallenda's walk across the gorge. Clearly Nik Wallenda was a man of faith and knew that he wasn't stepping onto the two-inch cable alone. As I breathlessly watched him pray his way through perhaps the longest twenty-two minutes and fourteen hundred feet of his career, I couldn't help but marvel and be moved by this man's bold and daring faith in God. As he praised Jesus for the spectacular view high above the canyon and invoked His protection and power over the winds that buffeted him constantly and would have caused a lesser man to plummet to his death on the canyon floor, I was both convicted of the frailty of my faith and encouraged that there is far greater power at my disposal to handle to challenges of my own life. I am reminded of Psalm 18:32-33 (NKJV): "It is God who arms me with strength, and makes my way perfect. He makes my feet like the feet of deer, and sets me on my high places." Nik Wallenda boldly demonstrated his sure-footed faith in Jesus, the One who calms the winds and walks with each of us through our challenges. May God grant us each that same faith to boldly proclaim the name of Jesus, invoke His power to stand against the storms of life, and ascend to the high places where we can see His glory. During summer vacation my daughter and I discovered the program "Lost" on Netflix. When the series aired on network television a few years back I had neither the time nor the interest to watch it week after week. But since watching the first episode we are hooked and have spent some portion of every day following the journey of these survivors as they await their rescue. Why is it that I find this particular program so fascinating? Perhaps it is because of the strange plot twists and character flashbacks. Or maybe it is because the survivors of the plane crash are looking for the same thing most of us are seeking -- hope and rescue. Sadly, though, at least at this point in season two, hope has been hard to find and rescue efforts have been elusive at best. Instead there has been a lot of tragedy and loss and heartbreak. Sounds a lot like our lives, doesn't it? Some days I feel like I am living on a desert island with no working communication devices. I know people who have given up hope that life will be anything but miserable, and my attempts to convince them there is hope are futile. Despite the fact that I have found my way off the island of despair by embracing a personal relationship with Jesus and the truths of God's Word, I cannot convince them that there is indeed hope and a better life waiting for them if they will do the same. Even as I swim against the tide of religious animosity and social dysfunction, I hold on to the only hope I know -- Jesus, the anchor of my soul. I continue to hold out the Word of hope like a life preserver, hoping the lost ones I care for will reach out and grab on before it is too late. I fight against the rip tide of discouragement the only way I know how -- by praying and calling constantly on the precious name of Jesus, my Savior -- knowing that the One who saved me can also save my lost loved ones. He can save yours, too. "Humpty Dumpty sat on a wall, Humpty Dumpty had a great fall"...yada yada yada, Humpty. Seems you're in good company these days. In faith on God's name she did call. How could life have turned out this way? To find peace, Lord; please show me the way." In the good and the bad times of life. Let my Peace find its home in your heart." Exactly one year ago, on June 15, 2012, my husband unexpectedly lost his job and we began our journey through a revealing year. In the twelve months that have followed our lives have been changed for the better as a result of the revelations we have received. Despite an eighty-five percent reduction in our income God revealed that He truly is a faithful provider. Working through friends and family to furnish stand-in appliances when our oven and refrigerator died, gift cards and money orders to help cover expenses, and encouragement when despair threatened to steal our peace, He met us at our point of need over and over again. God also revealed aspects of our character that needed tweaking. He grew our faith when worry and doubt clouded our vision and showed me that deep inside I had some real anger issues that needed to be confessed and resolved. Some days I still struggle with anger and resentment simply because I live in a fallen world. Even as God revealed himself in a thousand different ways He also restored our faith in humanity. Creditors were more than patient and understanding as we worked to arrive at payment solutions that would be mutually beneficial. People I have never actually met were kind and caring. Even the government provided health care benefits for our kids when we had no medical insurance for them or us. Six months ago God put Steve in a full-time job. Last summer I re-entered the work force to help out financially and was blessed with new friends and opportunities as a result. Having recently resigned that job, now I am back at home doing the things I love, like spending more time with Him, managing a busy household, and writing. I am also working part-time at a job that gives me flexibility and the opportunity to make a difference. Whatever it is you may be going through, ask God for a fresh revelation of himself. Hang on tight and enjoy the ride. He is bigger than any problem you face. He knows the way that you take. When He has tested you, you shall come forth as gold (Job 23:10). The past couple of days I have been faced with a personal dilemma that has been difficult to deal with. I have cried buckets of tears, prayed without ceasing, and considered my options. When I have been on the verge of making drastic changes, I've stopped dead in my tracks to do more crying, praying, and waiting on God for answers. What do you do when your stress is constant and you don't know what to do? Seek advice from online articles and Christian self-help books? (I do.) Talk to friends? (Me, not so much. They all have their own problems.) Read Scripture and cry out to God? (That's a big yes for me!) Do something you enjoy? (Never hurts to do something for yourself on occasion, especially if it relieves the stress for awhile). The thing we most need to do is the very thing we forget to do -- focus on God. When we are facing financial difficulties, stress at work, illness, or the heartbreak of parenting wayward children, we quickly lose our focus on God and allow these other things to become strongholds that steal our peace and make our hearts bitter. I have to repeatedly remind myself to be thankful for the blessings God has bestowed on me and not focus on my problems. Sometimes I have to praise my way out of a pity party (that happens a lot!). God's Word tells us plainly what we should do, even when we don't know what to do: "Rejoice always, pray continually, give thanks in all circumstances; for this is God’s will for you in Christ Jesus" (1 Thessalonians 5:16-18). Nowhere in Scripture are we told to fret, worry, or cry ourselves to sleep, but that is precisely what many of us do. Instead, we are commanded to carry one another's burdens (Galatians 6:2), cast our cares on God (Psalm 55:22, 1 Peter 5:7), and "trust in the Lord with all your heart and lean not on your own understanding; in all your ways submit to him, and he will make your paths straight" (Proverbs 3:5-6). Next time you are at a loss for a solution, stop looking for it and start looking for God. Seek Him first and the solution will eventually become clear. Sometimes life is disappointing. The other day my husband took my hand-me-down Buick to a local garage to have the air conditioning serviced. We knew there was a problem since my father-in-law had to have the air conditioner charged with Freon last summer and it hasn't blown cool air since the weather got warm this spring. When the mechanic began putting Freon in the unit, coolant began "spewing out everywhere" due to a broken compressor. We were told that repairs to the air conditioning system could be as high as $800-$900 because the compressor would have to be replaced. Needless to say my heart sank at the realization that I would have to bear with the heat until we could save money to have it properly fixed. I almost cried. That kind of disappointment has happened over and over the past twelve months. Between my husband's job loss, broken appliances, medical expenses not covered by insurance (because we had none), and just the stuff of everyday life, I have been at a low point and on the verge of tears many times. Sometimes I have cried like a baby, but others times I have resolved not to shed tears but praise God instead. Without fail, every time I have chosen to praise God and thank Him for the other blessings in my life, rather than complain about the disappointments, God has blessed me with His encouragement. Sure, it is easy to praise God when everything is going our way. But what about those times when it isn't? Can we praise Him then, even if our hearts might not feel thankful because of our circumstances? If I were to do as Erma Bombeck suggested and make lemonade out of the lemons life throws at me, I could sell enough lemonade to put every ambitious kid's lemonade stand out of business! Sometimes I do my best praising when it appears I am in no position whatsoever to praise God. I don't have to have the best of everything because I have all of Him, and that is reason enough to give Him glory. According to all the home and garden magazines, baskets are supposed to be handy and aesthetically-pleasing receptacles for organizing our stuff. 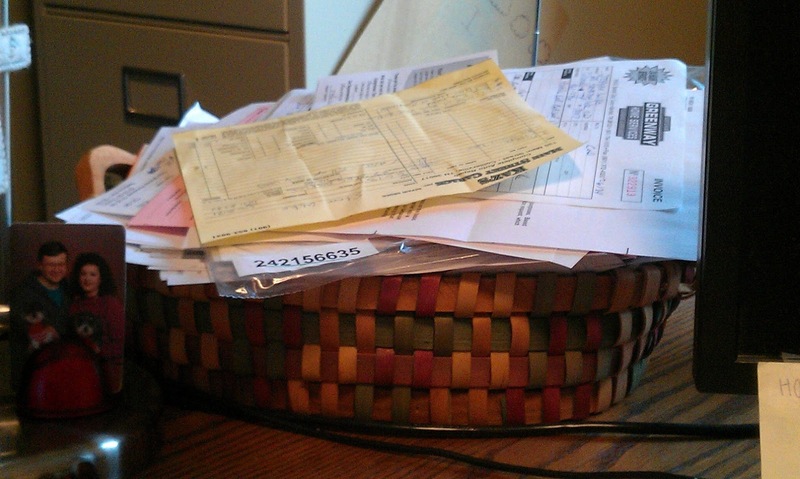 The problem is, when we don't periodically clean out those baskets, they begin to look like my filing basket. Can you tell I hate to file? Filing is a necessarily evil, at least in terms of paperwork. I thought computers were supposed to eliminate all the paperwork, but that hasn't happened in my world. 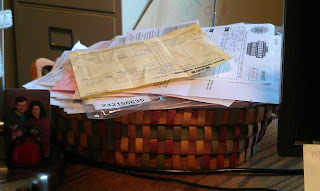 Although each of these pieces of paper has a designated file in my filing cabinet, I find myself periodically having to sift through the basket to find an important piece of information, all because I have neglected to do simple daily or weekly filing. But paperwork is not the only thing we need to file away. Even more important is the need to file God's Word in our hearts and minds so that when the need arises we will have the truth we need to face any crisis, keep from sinning, and make decisions that require greater wisdom than we possess. For me, filing God's Word is best done in the morning during my quiet time as I read devotionals, but with the technology available to us today we can take in His truth anytime, anywhere. We need to hide God's Word in our hearts, that we might not sin against Him (Psalm 119:11). In Romans 10:17 we are told, "Consequently, faith comes from hearing the message, and the message is heard through the word of Christ." How can we have faith if we don't know the truths of God's Word and the promises that He has made to those who believe in Him? If your life is not what you want it to be and you find yourself struggling with fear, anger, anxiety, and a lack of direction, it may just be that you need to take some time to open God's Word and do a little filing. Then you will have the truth you need to stand on when the time comes. Last night my husband and I went on a movie date for the second time in two weeks. This time I offered to buy the tickets. As usual, this was a spur of the moment date and we were running late. In my haste, I did not pause to verify the amount of money charged to my debit card. It wasn't until we were well away from the ticket office and past the ticket taker that I looked down and noticed that we were charged for senior admission. I couldn't help but smile and think, "It pays to be gray." Normally I would have checked my receipt and corrected the cashier so he would not be held accountable for the error. But I have found that trying to be honest often results in embarrassment for the one who miscalculated my age based on my hair color. I decided in this case to receive the blessing and enjoy the movie. Recently I considered coloring my hair because I am not old enough for senior discounts and don't feel a day over thirty. But a recent dream that an attempt to cover my gray resulted in purple hair quickly nipped that idea in the bud! Besides, I have worked hard to attain my "crown of splendor" (Proverbs 16:31) and it goes with everything in my wardrobe! I figure that if God wanted me to be a tall, thin blonde He would have created me that way. It is enough to know that God loves me just as I am--gray hair, cellulite, and all! It doesn't matter whether we are dyed, tucked, plucked, tattooed, or simply natural, God loves us merely because He created us. Contrary to what the world says, true beauty comes from within and is a reflection of a heart that belongs to God. Knowing that God has created us in His own image and that "People look at outward appearance but the LORD looks at the heart" (1 Samuel 16:7), isn't it more important that we focus on the condition of our hearts? After all, "Beauty is as beauty does." A couple of years ago I joined a handful of my fellow authors at a book fair in Nashville, where we discussed life, book publishing, and cars. Yes, cars. We talked about what our ideal "author car" was. 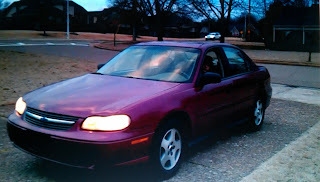 At the time I was happily driving the cute red sedan pictured below, which my son now claims as his. I was quite content and comfortable driving that little car. It was all I needed to haul kids, groceries, and books from here to there. Now that my teen is older and in need of his own transportation, I am blessed to have inherited a roomier and more comfortable car to drive. I must say, it is the hottest car I have ever driven. Literally. Yep, that's it. 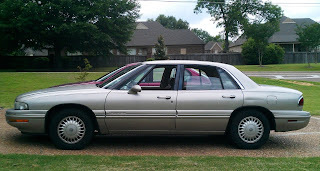 A 1997 Buick LeSabre with NO air conditioning. It doesn't get any hotter than that, especially here in the sweltering south! We are called to be doers of the Word and not hearers only (James 1:22). Instead we are often guilty of being "all talk and no action." I don't know about you but rather than be known as a person who is "full of hot air," I want to be known as a breath of fresh air to those God brings across my path. Today I did something that I have been threatening to do for months, if not longer. I removed a thorn that had been a source of irritation to me for a long time and an idol to a loved one who could not see how harmful it was. This thorn had become a distraction, an annoyance, and expense that we could no longer ignore or afford. Removing it was costly in more ways than one, but I have no doubt that in the long run the pain of eradicating it will give way to a bigger blessing. Sometimes we have to give up something we feel we cannot live without in order to move in a positive direction in our careers, our relationships, and ultimately our faith walk with God. When possessions or relationships become a stronghold that keeps us from God's good and perfect will for our lives, we are fools if we don't cast down our idols. Plainly His Word tells us that we are to have no other gods before Him or make for ourselves idols of any kind (Exodus 20:3-4). But often we get so caught up in our blessings that we forget the Blessor! In 1 John 2:15-17 we are commanded, "Do not love the world or anything in the world. If anyone loves the world, the love of the Father is not in him. For everything in the world--the cravings of sinful man, the lust of his eyes, and the boasting of what he has and does--comes not from the Father but from the world. The world and its desires pass away, but the man who does the will of God lives forever." If your possessions own you then perhaps it is time to get out the tweezers and remove a thorn or two, then set your affections on the One who lavished His love on you (1 John 3:1). You cannot take the things of this world with you into the next so "store up for yourselves treasures in heaven, where moth and rust do not destroy and thieves do not break in and steal. For where your treasure is, there your heart will be also" (Matthew 6:20-21). In Heaven There's Only Decaf! Hi, my name is Dee Dee. I'm a coffee-holic. There, now you know. Well, you probably already knew that but lest you need any suggestions for a birthday or Christmas gift, let me make the shopping easy for you -- a gift card to my favorite coffee shop is ALWAYS the perfect gift! But on a more serious note, last night I had a dream that would normally have left me in a state of tearfulness and panic. Every mother has these dreams now and then. I dreamed I lost my child. In the dream she was a toddler playing in a muddy section of my yard and the earth just swallowed her. I was beside myself with fear and grief. Determined to rescue her I went into the mud and felt around for her but could not find her. Giving up, I cried, "This just isn't right!" Not long after, a neighbor carried her in to me. She was covered in mud (picture Jean Valjean emerging from the sewer in the movie "Les Miserables" and you have some idea of how horrible she looked). As I held her lifeless body she took a breath then struggled to open her mud-caked eyes. Wiping the mud from her face, I was thrilled as she opened her eyes and said, "Mommy, I went to heaven today." I have often heard of instances where people who died and were revived gave a detailed account of having been transported to heaven, where they saw all sorts of beautiful sights and the people who had gone before them." "You did, Baby? Tell me about it." Needing at that moment a cup of coffee to calm my frazzled nerves, I asked, "Baby, do they have coffee in heaven?" "No, Mommy," she replied. "In heaven there's only decaf!" I don't know whether there will be coffee in heaven (Lord, I hope so) or anything remotely close to it, but I know what won't be there -- brokenhearted parents who have lost children; lonely adults who have lost a spouse; drug addiction; domestic abuse; cancer; fibromyalgia; financial lack; hunger; bullying; human trafficking; abortion; crime; corrupt politicians; religious persecution; rampant immorality; sorrow; and pain. There will be no more tears. Instead, we will live in the light of the Risen Lamb, worship and serve the King of kings and Lord of lords, and live eternally in a place whose wonders we cannot fathom (Revelation 21). Heaven is reserved for those who have placed their faith in Jesus Christ (Revelation 20:15, 21:27). There is no other Name by which we can be saved (Acts 4:12). By receiving Him as Savior and walking with Him by faith, we can experience the hope and joy of heaven today through a personal relationship with Jesus. As parents of teenagers so often we find ourselves frustrated by an unknown enemy that we cannot seem to conquer. Our kids do crazy things that make no sense to us, yet no matter how hard we try it is impossible to talk any sense into them. There is an unseen force that underlies their behavior, often resulting in substance abuse, sexual addiction, or even crimes against society. Helpless, we scratch our heads wondering, "What is wrong with my kid?" I am currently in the throes of parenting teenagers and have experienced many of the same frustrations most parents of teenagers do. My kids are good kids with great love for their friends, but there is something about this generation of young people that is destroying them and robbing them of God's great plan and purpose for their lives. What is that unseen enemy? This is something I have pondered a lot lately and I believe the unseen enemy is approval addiction. What is approval addiction? It is that desire to please people, particularly those in our peer group, at any cost. It is an addiction that causes us to lose sight of ourselves, who we are in Christ, and the plan and purpose He has for our lives. Often it leads to other addictive behavior as a way to cope with our feelings of insufficiency and inferiority. As a teenager I really struggled with approval addiction. My parents had divorced before I was born, or shortly thereafter, so I never really knew my birth father. My mom remarried before I was two, but as I was made aware that Daddy was my stepfather, not my real dad, I struggled with feelings that I was somehow inferior because I was another man's child. It took me years of trying to prove myself to my Daddy to ever feel truly accepted by him. In college and for several years after, that need for approval and validation carried itself into every dating relationship I had and was, I believe, the underlying reason I developed an addiction to alcohol. I drank to fit in and to give myself the courage to do whatever it took to be accepted and to please the people in my life. Although I had been raised in the church, knew that God loved me, and had given my life to Him, I struggled with acceptance and a low self-esteem, which took a huge toll on me emotionally, physically, and spiritually. In fact, it nearly cost me my life. Even while working in full-time ministry many years later I suffered with approval addiction. I found myself passionate about my work and the people with whom I worked. I worked long hours and neglected the ones who needed me most -- my family -- simply because it felt so good to be commended over and over again for the good job I was doing "for the Lord." I possessed unique gifts that helped me accomplish great things and I loved the constant affirmation I received from those I served. I was addicted to the approval of men, never fully understanding that the only approval that mattered was God's. When He finally revealed to me that I loved the approval of others more than Him, and that I had sacrificed my ministry to my family on the altar of my ministry to the Church, I resigned the job I loved and became the stay-at-home mom I had wanted to be all along. Looking back on those years and seeing the struggle my teens and their peers face today, I can see that so many of their issues as teens and our issues as parents are rooted in approval addiction. They will do anything to be accepted by their peers and we will neglect doing the hard job of godly parenting in order to be accepted by our kids. Oh, that God would give us eyes to see the unseen enemy of approval addiction and the courage to walk in the freedom of God's unconditional love! "Keeping it real" is a phrase we hear often in today's world, but have we stopped to truly consider what it means? If you consult the Urban Dictionary (www.urbandictionary.com) you will find a lot of answers to that question, many of which resonate with my personal understanding of the phrase. To me, "keeping it real" means being true to myself, my values, and my faith. It means living each day with honesty and integrity and making sure that I don't pretend to be something I am not. Often it means doing what I feel is right based on my knowledge of God and His Word, regardless of the opinions of others. It is taking the risk of being myself in a world which dictates who I should be. At fifty-something, I don't meet society's standards for physical beauty. I'm not the perfect parent, the most loving wife, and I'm certainly not the perfect Christian. But if there is merit in the effort, any approval from God of my obedience to His Word, then I am perfectly content to press on toward the goal of becoming the woman He created me to be. I'm not there yet, but I am keeping it real because I have learned that there is great freedom in breaking free from the expectations of others and living in the light of God's acceptance, "just as I am." Are you keeping it real? If not, try it. You'll like it!